Every now and then (OK, more often than not), I get these random thoughts or ideas. So, I write this stuff down (if I remember to) and look it up later. Right now, for instance, I'm googling "biggest McDonald's play place" in another tab. Having small kids, I thought it might be a cool thing to check out. FYI, it's just south of Orlando, FL. It has an elevator leading up to a kids' treehouse themed area, the usual tubes and slides, a toddler area, and - get this - an arcade. Whoa! In a separate tab, I'm googling pics of something altogether different.. "icebox early 1900s." I know, random, right? I was thinking yesterday(ish?) that I don't think I've ever seen a real one. I mean, I've seen plenty of refrigerators, come on! But an icebox? Like my great-grandmother used? Nope. Can't say that I have. Apparently there are lots of different sizes of these, and they were made from different types of materials. Like any type of furniture, you could buy the icebox of your liking, or simply whichever type you could afford. For those of you (if any) who may not know what I'm talking about, an icebox is not just a type of pie. It is (was) the prelude to our present-day refrigerator. Our grandmothers and great-grandmothers would buy a block of ice and store it in one compartment of the icebox. Then perishable items such as milk and meat would be kept in a separate compartment, to be kept cold. Of course, the problem with this is that once the ice would melt, Granny had to replace it and clean out the water or empty the tray that caught the water. And I can imagine the icebox didn't keep things too cold for too long. Thank goodness for current technology! The fourth tab I have open right now is a search for a cinnamon apples recipe. Yum. Fall is the perfect time for these. Hubbs and I love cinnamon apples, and, having discovered some decently priced manzanas here, I thought I might try to make some. Maybe. If I'm feeling creative enough. I'm not sure why I'm telling the world these things, but it does make me happy to think that perhaps someone else out there was wondering "Hey, am I the only one who has intruding random thoughts?" No, Dear Someone. You are not alone. 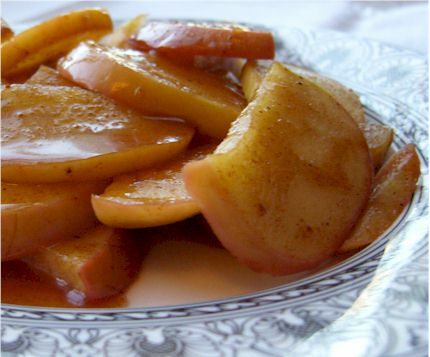 Yum for cinnamon apples and hooray for freezers! This is fun!